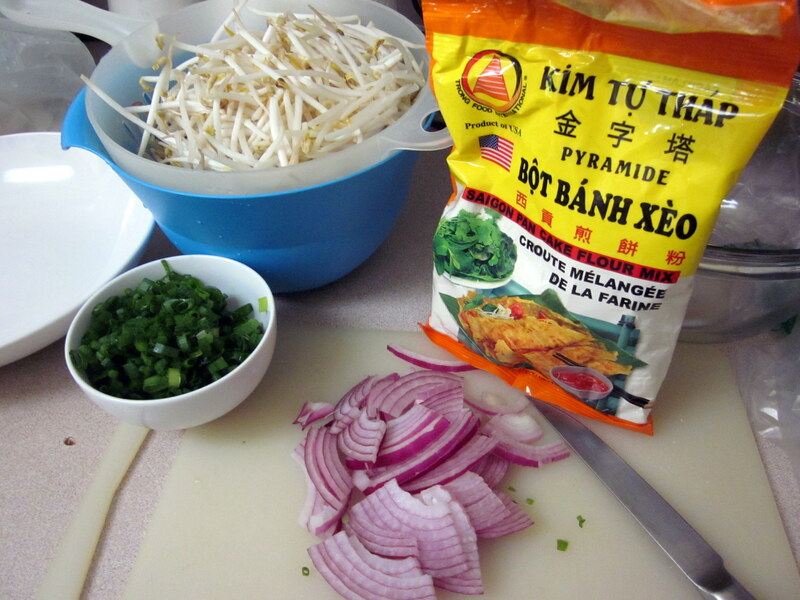 Combine the banh xeo batter, water, and milk as directed on the package. Stir in the chopped green onions. Set aside for 20 minutes. Chop the pork into thin 1-2 inch slices. Salt and fully cook the pork in a frying pan over medium high heat. Drain and set aside. Heat a little cooking oil in a large frying pan over medium high heat. Add a few onion slices and 3-4 shrimp to the pan. Using a ladle, distribute batter in a thin layer to the pan. Cover and cook for 2 minutes until crispy. 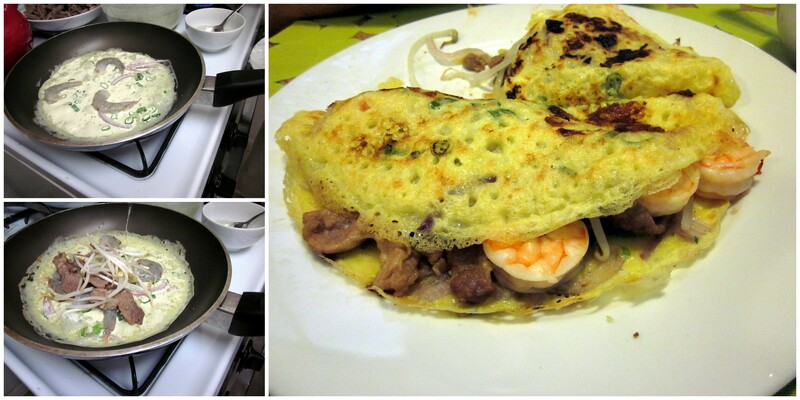 Add cooked pork and bean sprouts and fold crepe over. Cover and cook for another minute to desired crispness. Slide banh xeo to a plate. Serve immediately with lettuce/mint/basil and dipping fish sauce. I need 3-4 of these to get full, but it depends on how big you make your crepes and how much filling you use. I eat it like a salad—put some banh xeo in a bowl, add some torn lettuce/basil/mint, pour on some fish sauce, and mix together. Much yumminess all thanks to my mom! 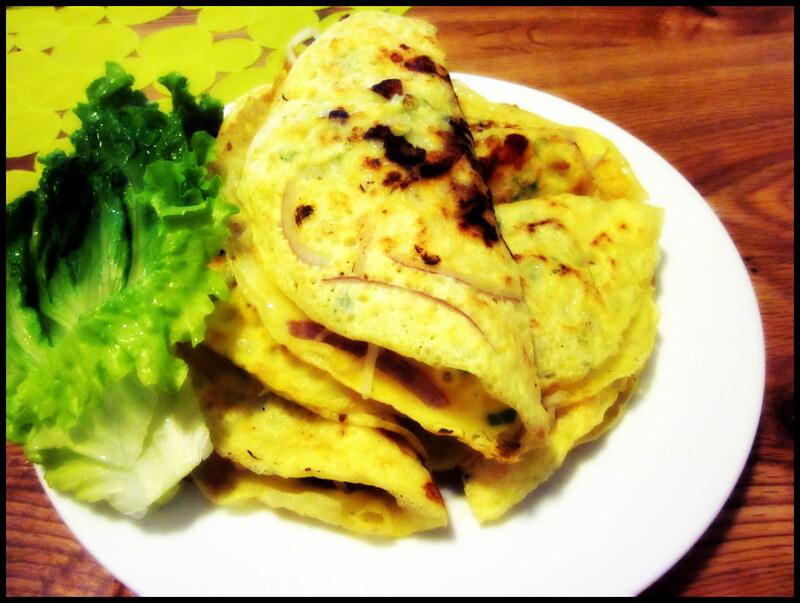 This entry was posted in Food and tagged Banh xeo, vietnamese crepe. Bookmark the permalink. one of my faves as well! This looks scrumptious. I love that it’s gluten-free and egg-free and the turmeric makes it look so lovely.